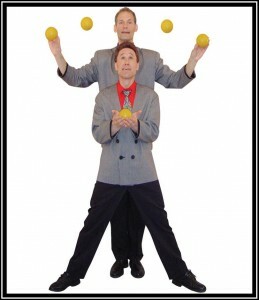 Tahoe Arts Project continues its 25th season with the comedy/juggler duo The Gizmo Guys on Friday, January 27th at the MontBleu Theater. Allan Jacobs and Barrett Felker have amazed and amused audiences around the world. They work in a great variety of venues including theaters, corporate functions of all types, cruise ships…. you name it, they’ve done it. They’ve made numerous television appearances, won international juggling competitions, and taught at top circus schools. But what makes their act so appealing is their uniquely winning combination of dazzling technique and infectious humor. 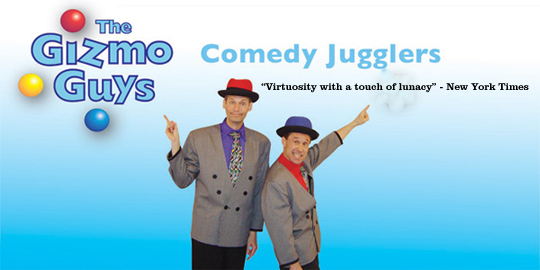 The Gizmo Guys’ rapid-fire act exhilarates and inspires sidesplitting laughter in audience members of all ages. The Gizmo Guys will bring their “Objects in Motion” show into the South Shore schools January 23-27 teaching children how juggling relates to science and math.School Schedule. Don’t miss your opportunity to see their full show on Friday, January 27th at MontBleu Theater at 7:00 PM. Tickets are $12 for adults and $8 for children and seniors and can be purchased in advance at the CA and NV Visitors Centers. To charge tickets by phone or for more information, please call Tahoe Arts Project at 530 542-3632.